Using liniments or poultices on a horse's leg can be therapeutic and ward off stiffness after exercise or competition. After a long workout, it's common for humans to ice their tired muscles. It's no different with horses, which can benefit from some type of care given to tendons, ligaments and muscles in order to recover after strenuous workouts. When it comes to warding off stiffness, soreness and swelling in horses, trainers and owners use two main product types: liniments and poultices. Each is a time-tested technique in equine care and each has its proponents, as well as best use cases. Understanding the differences between liniments and poultices can help trainers and owners arrive at the best course of action in providing therapeutic relief to their animals. Liniments are generally liquid products that are rubbed onto the skin. They also come in the forms of gels, but are more commonly associated with ointments and creams. Liniments are often herbal mixtures and distillations using various active ingredients like menthol, mint, eucalyptus, capsaicin (chili peppers) combined with assorted alcohols and essential oils. Liniments work by cooling or heating sensation on the affected areas to which the product is applied—the active ingredient will point to the liniment's methodology. Cooling is generally used for recovery after exercise or recent injuries or discomfort, while heating is used to manage existing conditions like reoccurring stiffness in one leg. This makes liniments a versatile tool for any trainer or owner. Keep in mind: heat up before, cool down after. Liniments are often applied directly to the skin, which points to the way they work: by opening pores and promoting blood flow. Increased blood flow allows for faster delivery of nutrients and and thus quicker healing. The vascular and neural reactions caused by liniment use also facilitate soothing effects or pain relief via a "counter irritation" effect. Often, liniments are meant for short-term relief. Their effects wear off within a certain time or without constant application, so be sure to check the labels of any product to get a sense of how to best use a liniment. What are the pros of liniments? Versatility is one of the draws to using liniments in your horse care routine. There are a wide variety of liniments with different active ingredients (either for cooling or heating), and the application of liniments can also take different forms. A gel may be rubbed directly onto a specific area or over the horse's body. Other types of liniments can be diluted in water and used for bracing. If looking to care for a cut, wound or abrasion, look specifically for an antiseptic liniment. 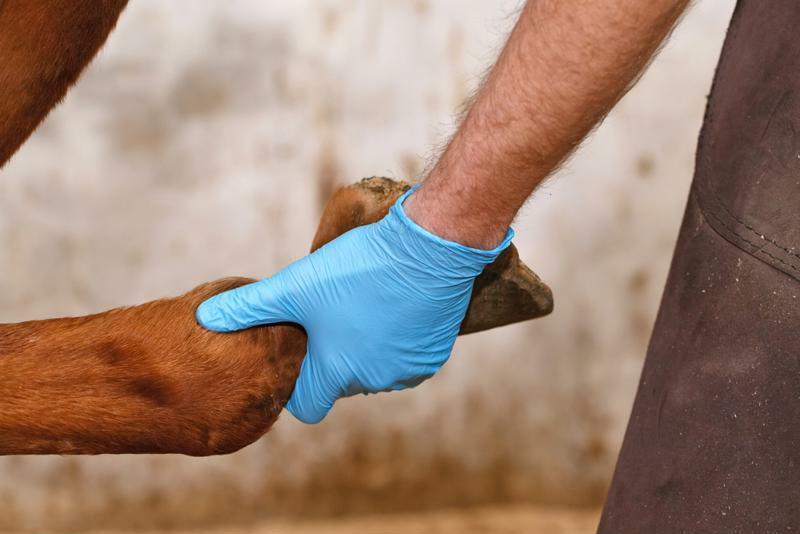 Applying poultices to a horse's hoof can provide relief from pain. Compared to clear and liquid liniments, poultices resemble coarse-looking pastes. Actually defined as soft, moist masses, poultices are usually made using clay, cereal bran or herbs. Most often, poultices are used as cold therapy in the same way some liniments are used to alleviate stiffness, soreness and swelling. Poultices can be applied to the lower leg and hoof. First, the sticky mixture itself is spread a quarter to a half an inch thick in a certain area, and then wrapped and compressed with damp paper and covered by cotton sheeting, quilted pads and then bandage wrap. This prevents any slippage and is required because poultices are used over hours and often overnight. The therapeutic effect poultices can create is mostly related to the ingredients interacting with skin and underlying tendons and ligaments to counteract irritation or stiffness. What are the pros of poultices? Poultices are greatly relied on as easy preventative options to ensure high-quality horse care. Though they may look like something an unsupervised toddler might whip up, poultices are popular precisely because they work. Besides being used in cold therapy, poultices can also be found or made in hot variations. Such a substance can be used to "draw out' abscesses. While the decision between poultice and liniment will also come down to personal preferences or history of success, both options represent time-tested remedies for combating soreness, stiffness and swelling. Talk to the experts at Finish Line today for more information about liniments and poultices and how to best incorporate them into your horse care routine.